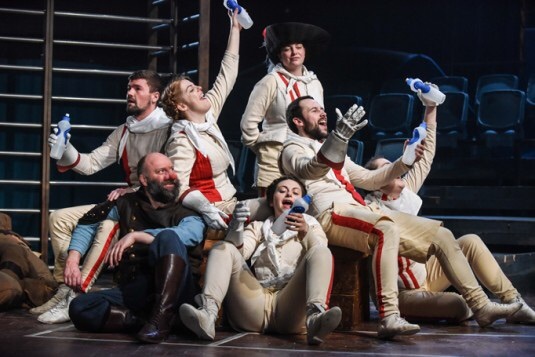 Cyrano de Bergerac: duelling meets the gymnasium? Lorne Campbell’s decision to stage Cyrano de Bergerac in a gymnasium is very strange indeed. But in spite of this, it’s still a production worth seeing. Right, here’s a fact I bet you don’t know. Anthony Burgess – yes, that’s the same Anthony Burgess of Clockwork Orange fame – was also a skilled literary translator, and amongst his translations is Edmond Rostand’s 19th century classic, Cyrano de Bergerac. Set in swashbuckling France at the height of the Three Musketeers era, Cyrano de Bergerac is an legendary duellist and respected commander of the French Army, let down only by his ugly long nose (and woe betide anyone unwise enough to poke fun at it too much). His less-known weakness, however, is his love for Roxanne, disguised so well even Roxanne believes him to be only a friend. But Roxanne loves handsome Christian, a new recruit to Cyrano’s company, and he agrees to act as a go-between. But Christian, shy and lost for words, relies on Cyrano to write his love letters for him. Wait a second, I think I’ve seen this story before. And from what I recall, it never ends well.